Picture of a single shuttle wave edge bookmark I tatted, using a blue-white-purple variegated size 10 thread from Germany. I purchased my first tatted piece from another tatter, a set of post earrings from KrystleDawne on Etsy. They are gorgeous! Video tutorial shows how to join two elements together in tatting, using a picot and small crochet hook. My mom is learning to tat with my Absolute Beginner tatting video tutorials, and successfully managed to shuttle tat her first ring. A brief explanation of several basic tatting terms. Focus is on terms used so far in the Absolute Beginner Tatting Series. 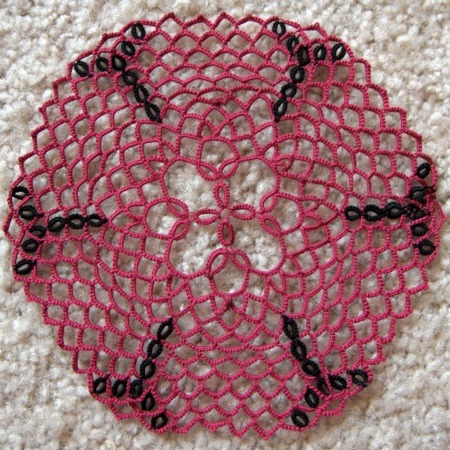 This video tutorial shows how to make picots in shuttle tatting. Plus a photo seek-and-find game tests your ability to spot these tatted loops and joins. My first giveaway! Here is a toolkit of all your essential tatting supplies for one lucky winner. Many ways to enter, for more chances to win. Video tutorial shows how to make the ring in shuttle tatting. This involves tatting with only one color, and describes a tip to check if all your double stitches transfer, or flip, correctly.